HERMITAGE-NIKS--the five-part, in-depth series version of THE HERMITAGE DWELLERS-- is not necessarily about the art that resides in the world renowned museum, but about the people who work in the Hermitage. These "Hermitage-Niks" all have their own very personal reasons for considering the palace of Catharine the Great their "home." For them, it is a safe haven that quite literally has managed to keep the tumultuous Russian 20th century history outside its walls: from the Revolution, the terror of Stalin, WWII, the harsh post-Soviet years - all these events have left their mark on the museum. What starts out as a playful kaleidoscope of people and events in the museum gradually unfolds into a poignant account of how the dwellers' pain is transformed by their intimate relationship with a piece of art. For most people, art is an embellishment of life, but it can also be an indispensable counterweight for the darker side of our existence. Given the catastrophes that Russia has gone through in the last century, art is certainly not a superfluous luxury. 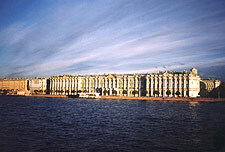 The Hermitage-niks (Hermitage Dwellers) do not work for money (their jobs are badly paid), but for "that other thing." Art handler Vadim, attendant Valentina and curator Juna tell us about their most beloved artworks and explain the essence of the so cherished concept "Hermitage-nik." Alexandra (82), icon curator, has spent her entire life rescuing icons from destruction and has managed to amass quite a collection. Just as icons come alive for Alexandra, the Rembrandt's Danae comes alive for other Hermitage-niks. This painting of "unworldly beauty" was severely damaged in 1985 by a lunatic. It was a most traumatic experience for the Hermitage, whose employees speak of Danae as if she were a dear friend. Olga (76), head of museum maintenance, is one of the oldest Hermitage-niks. This unofficial czarina of the Hermitage runs her department with a firm hand and is forever marked by the Second World War. The Hermitage-niks from back then saved the artworks from the mortality of war, but art was also their savior in times of hunger and cold. In the 1930s, Stalin sold off the collection's best works. With pain in their hearts, the Hermitage-niks reflect upon this black mark on the history of the museum. If the works had not already been sold, they were hidden, buried away in the bowels of the Hermitage. This is what befell the wonderful paintings of Monet and Matisse. Stalin and his cronies looked at them as "capitalistic, depraved art." But the Hermitage-niks gave the censorship commission a taste of their own medicine. Czarina Catherine the Great is still omnipresent in her winter palace. Her megalomaniacal, gluttonous acquisitions form a stark contrast to the Hermitage's present-day purchases. Petersburgers with financial problems try to pass their last heirlooms on to the museum, while schoolchildren gape at the splendor of bygone times.